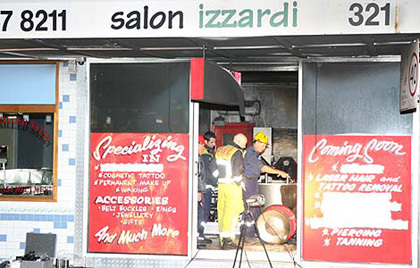 Craziness out of Sydney, Australia, where a tattoo shop was firebombed in what appears to be an escalating turf war between rival biker gangs, the Hells Angels and the Comancheros. The shop in question calls itself a cosmetic tattoo shop, but the manager of the property that is being leased by Angel’s Cosmetic Tattooing claims that there is no cosmetic tattooing being done and that instead, “full-blown tattooing” is going on. Full-blown tattooing? Is this really the time to split hairs as to what sort of tattooing is being done on the premises? Call me crazy, but the property was the target of two drive-by shootings this summer before being turned into a tattoo shop in September. From September to October it was in business until it was firebombed. I’m going to go out on a limb and suggest that maybe tattoos, cosmetic, full-blown or otherwise, aren’t the biggest problem here? At any rate, if you happen to live in Sydney and were planning to get some work done at this place, you might want to consider switching up that appointment to some place less…targeted. Drive-bys and firebombs tend to be bad for business. I’m just sayin’, that’s all. Check out the full story right here.